A delicious fresh yogurt tart. Great to take for brunch. Combine corn flakes, butter, and brown sugar in a medium bowl. Press into the bottom and up the sides of a 14x5x1 inch fluted tart pan with a re-movable bottom. In a small bowl sprinkle gelatin over water; let stand a few minutes. Microwave for 20 seconds until gelatin is dis-solved. Whisk together yogurt, milk, honey, and vanilla; whisk in gelatin until mixture is smooth. Microwave preserves until just until melted and pour-able. Meanwhile remove tart from pan. Arrange fresh berries evenly atop tart; drizzle with preserves. Another delicious option: Top the tart with a generous sprinkle of pomegranate seeds along with the raspberries. When melting the preserves, add 1 ½ Tbs. pomegranate juice. This brightens the flavors! 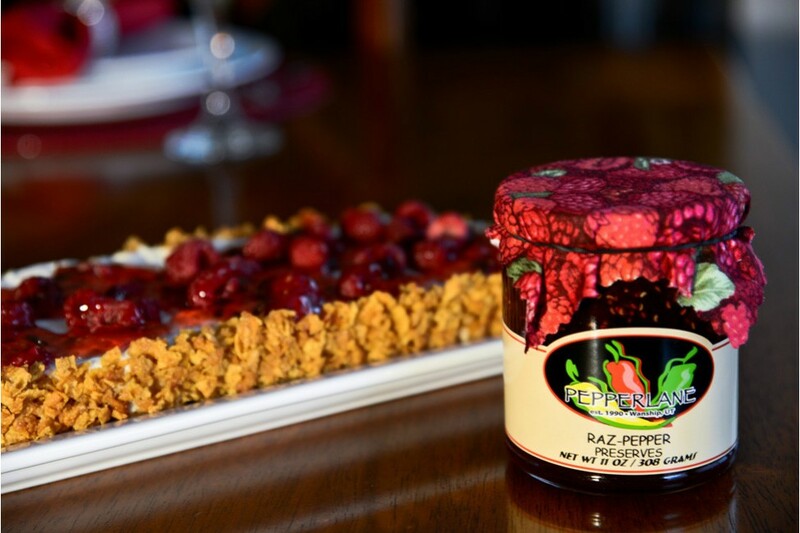 For an added kick, combine equal parts Pepperlane “Sweet Heat” Preserves and Raz-Pepper.